Are you experiencing ankle pain that hasn’t resolved with treatment at home or even by your doctor? Ankle pain can be caused by numerous conditions including arthritis, tendinitis, and injury to the ligaments surrounding the joint. Identifying the cause of ankle pain is not nearly as difficult as determining what type of treatment is best to reduce pain. Because the ankle is a weightbearing joint (in other words, you have to use the ankle joint to walk), it can be difficult to treat. Regardless of the injury, most doctors treat ankle joint injuries or pain with RICE therapy (Rest, Ice, Compression, Elevation) and an anti-inflammatory medication such as ibuprofen. Ankle braces and walking boots are also available to help stabilize the ankle joint for healing. 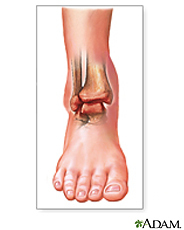 Most ankle problems can be treated with standard treatments just discussed. BUT, some people don’t respond to standard therapy and need to know what alternatives are available. At Advanced Podiatry, we offer our patients a treatment called Prolotherapy. Prolotherapy is a series of injections performed in the office that promotes regeneration of tissue in an injured area. Prolotherapy injections are different than cortisone injections. Prolotherapy is a natural solution consisting of an anesthetic and dextrose that promotes healing of tissue, unlike cortisone which can weaken tissue over time and make it more prone to injury. If you’re interested in Prolotherapy because you are suffering from ankle pain that will not go away regardless of the treatment you’ve tried, then call Advanced Podiatry at 813-875-0555 for an appointment with one of our doctors. Our doctors are trained prolotherapists that have helped significantly improve pain associated with arthritis, tendinitis or joint instability to the foot and ankle. Don’t let your ankle pain keep you from doing the activities you love!